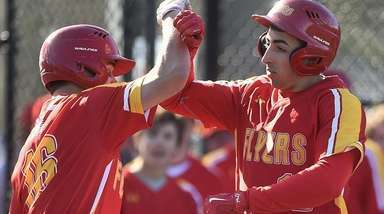 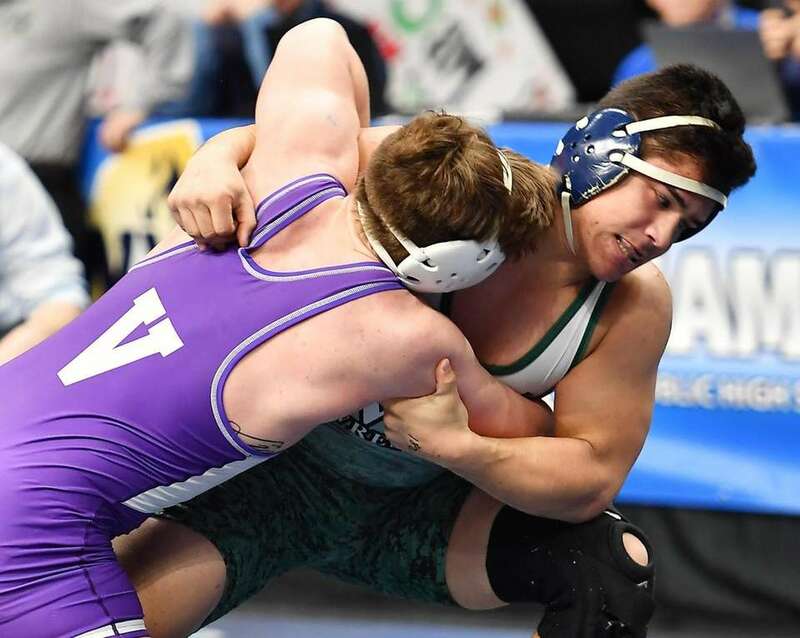 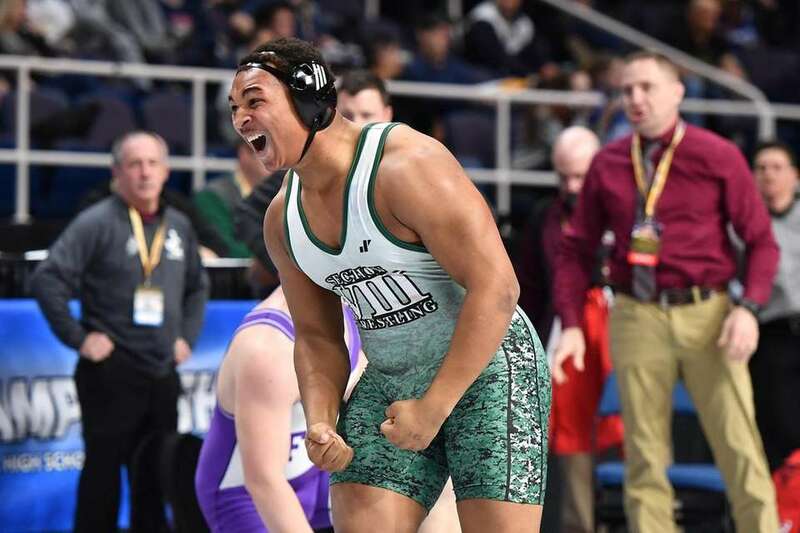 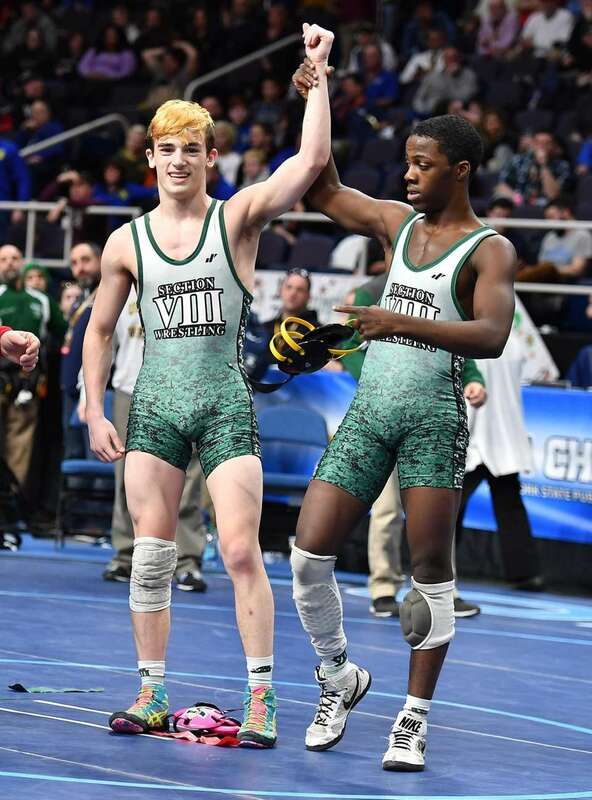 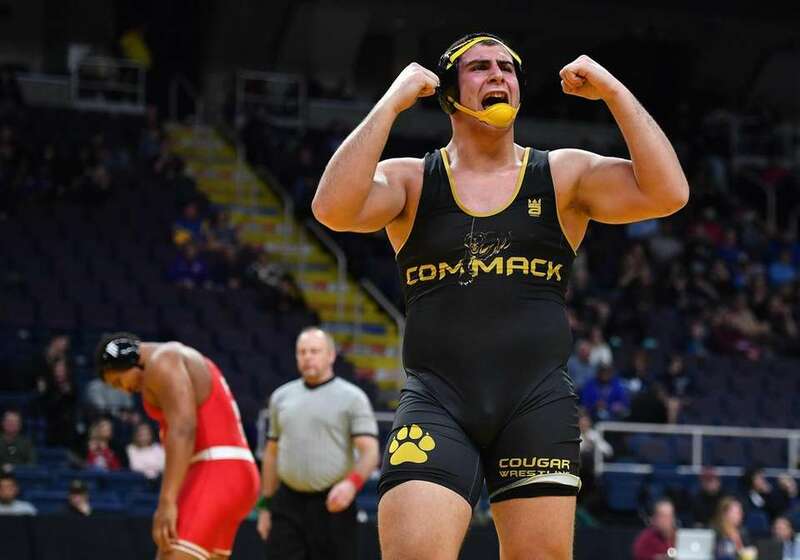 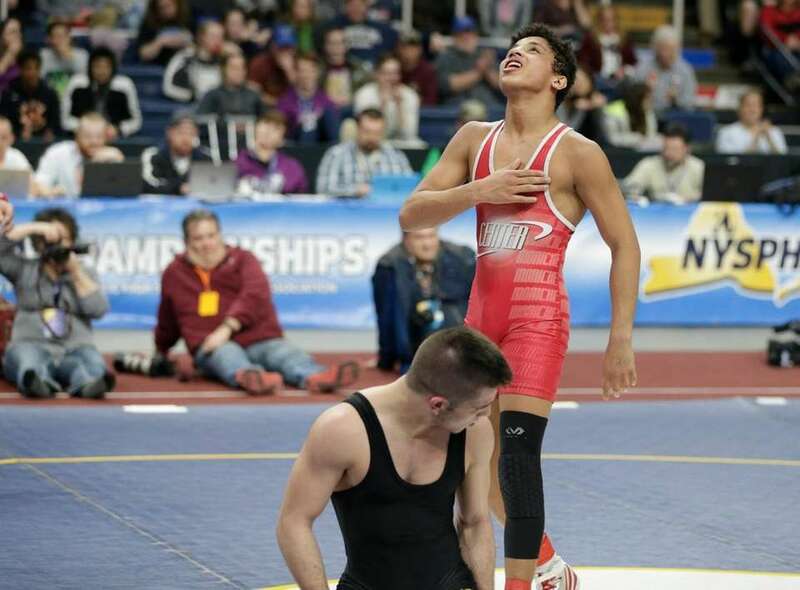 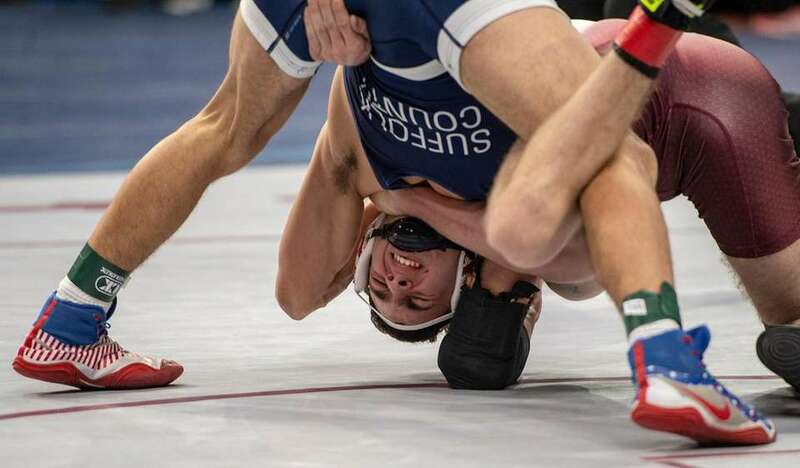 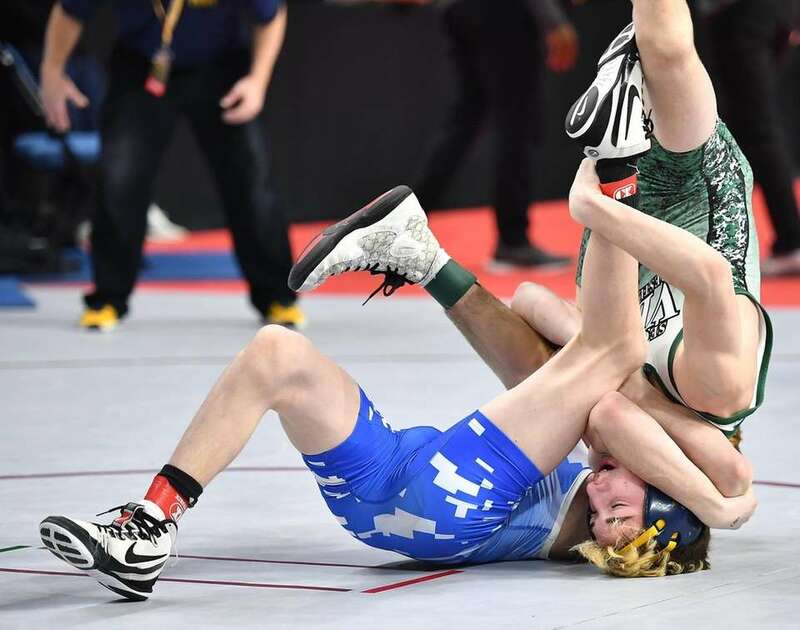 A collection of top photos from Newsday at the New York state high school wrestling championships at the Times Union Center in Albany on Feb. 22-23, 2019. 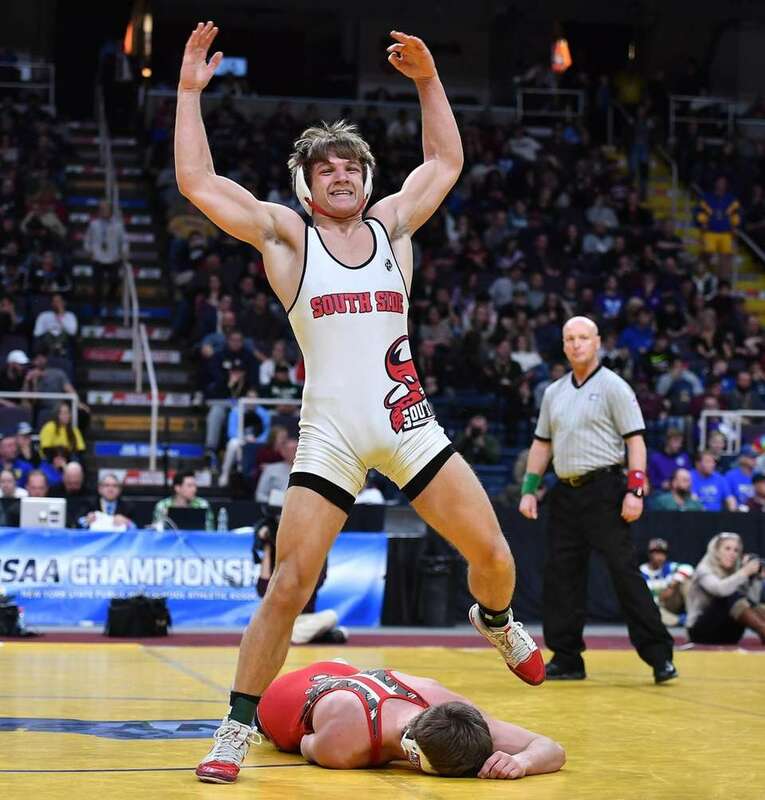 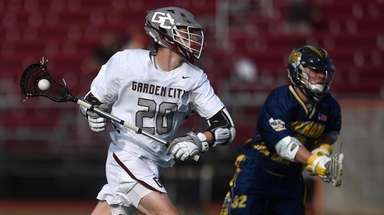 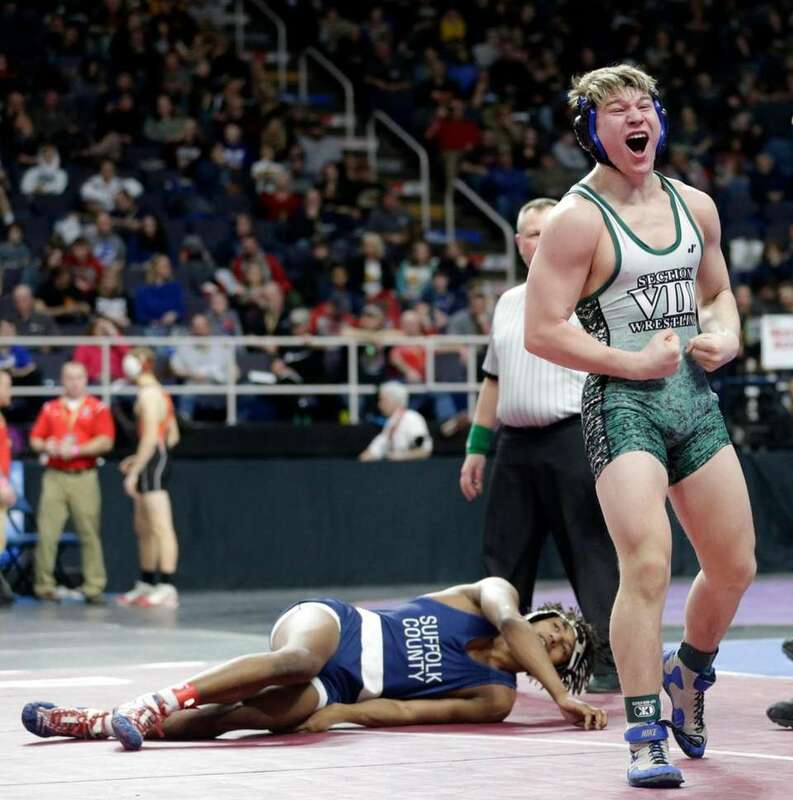 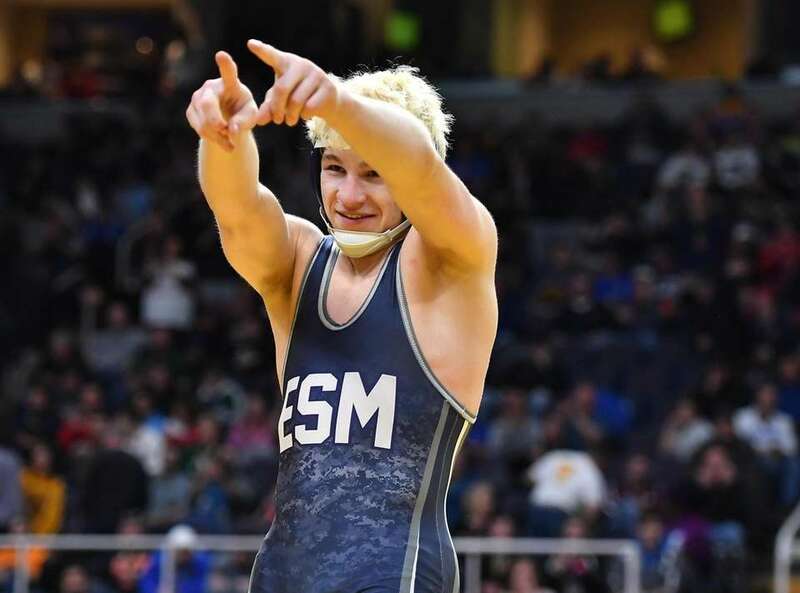 Kyle Mosher, South Side/East Rockaway defeats Cooper Kropman Penfield in the 160LB Div 1 final of the 2019 NYSPHSAA State Championships at the Times-Union Arena in Albany, NY on Feb. 23, 2019..
Jordan Titus, Center Moriches defeats Matt Garland South Jefferson/ Sandy Creek 5-1 in the 120LB Div 2 final of the 2019 NYSPHSAA State Championships at the Times-Union Arena in Albany, NY on Feb. 23, 2019..
Joey Slackman, Commack defeats Myles Norris, Freeport 4-2 in the 285LB Div 1 final of the 2019 NYSPHSAA State Championships at the Times-Union Arena in Albany, NY on Feb. 23, 2019..
Mike Blando, Massapequa vs Xavier Pommels, Unindale in the 132LB Div 1 Semifinal of the 2019 NYSPHSAA State Championships at the Times-Union Arena in Albany, NY on Feb. 23, 2019..
Jordan Titus, Center Moriches celebrates after he defeats Matt Garland South Jefferson/ Sandy Creek 5-1 in the 120LB Div 2 final of the 2019 NYSPHSAA State Championships at the Times-Union Arena in Albany, NY on Feb. 23, 2019..
Xavier Pommels, Uniondale is defeated by Alex Samson,Victor in the 132LB.Div 1 final of the 2019 NYSPHSAA State Championships at the Times-Union Arena in Albany, NY on Feb. 23, 2019. 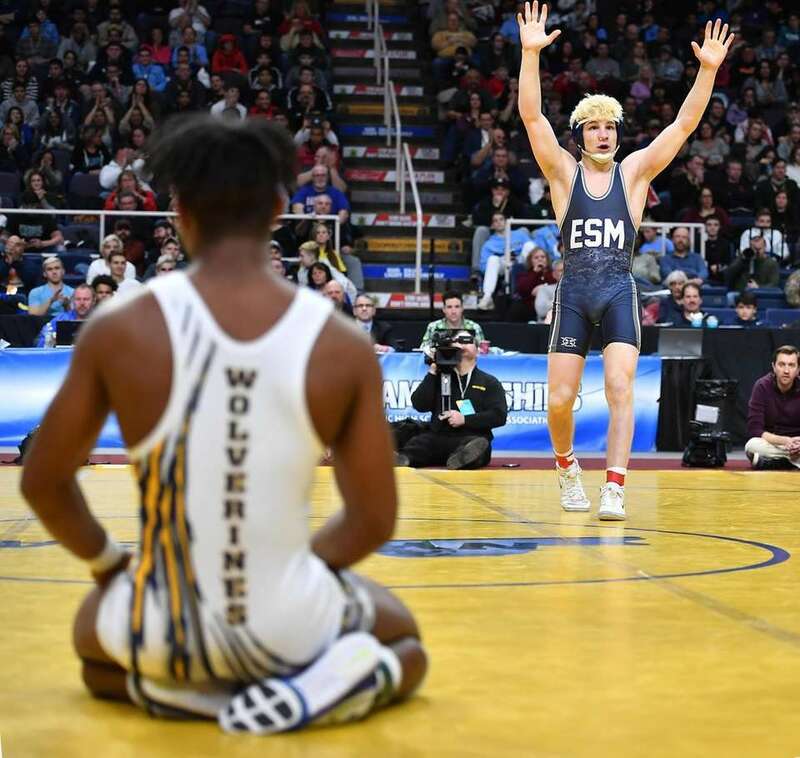 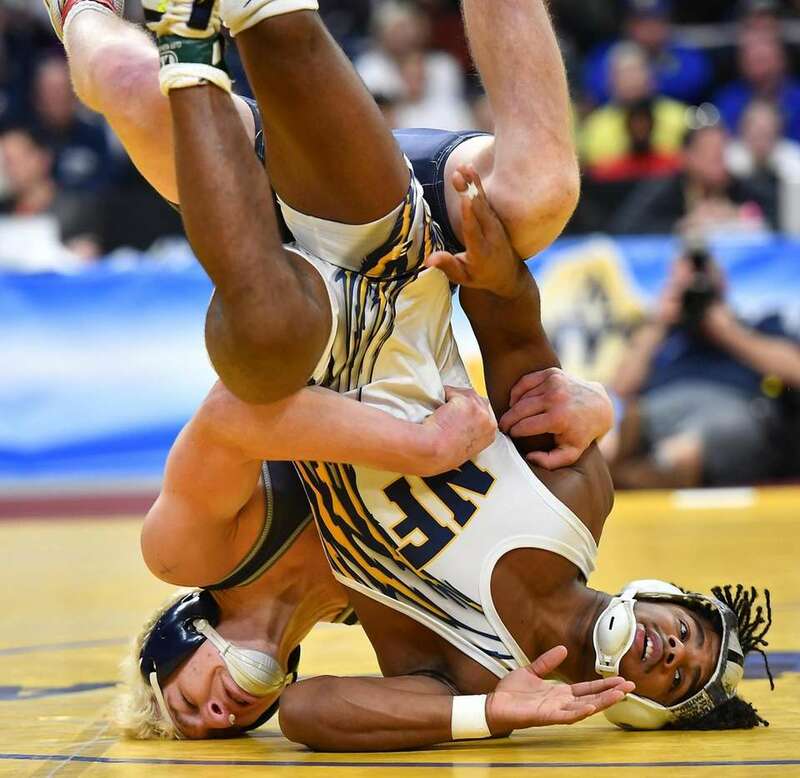 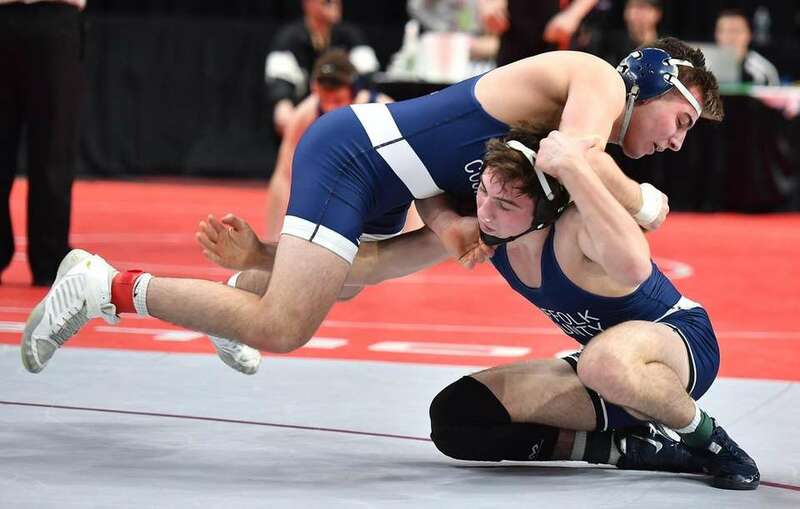 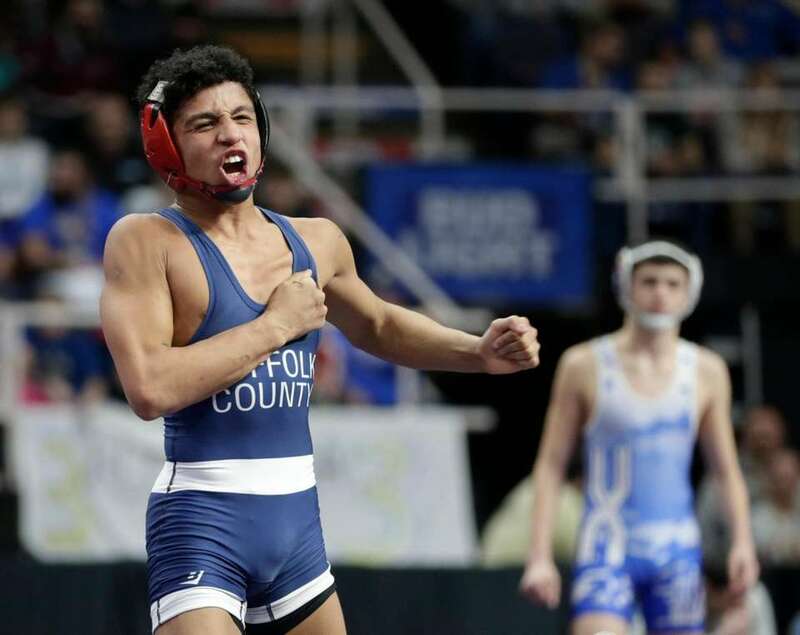 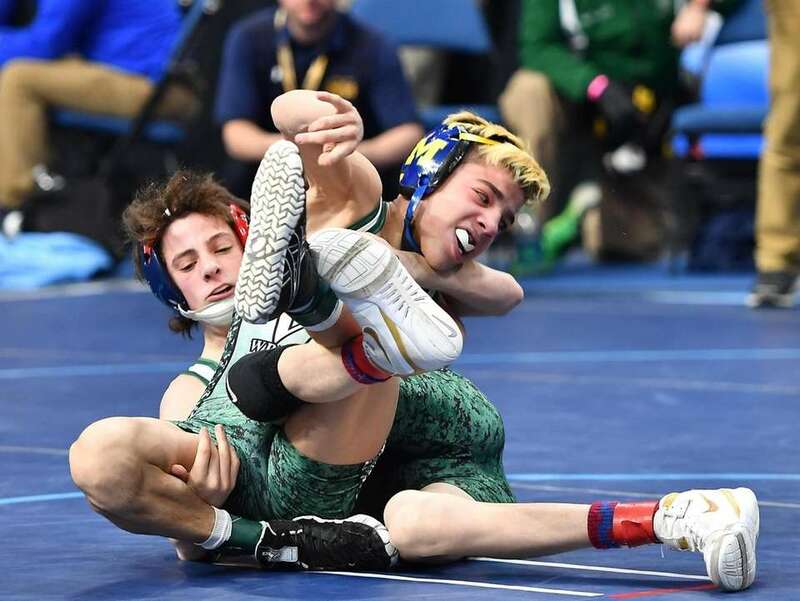 Mike Blando, Massapequa is the winner over Xavier Pommels, Uniondale in the 132LB Div 1 Semifinal of the 2019 NYSPHSAA State Championships at the Times-Union Arena in Albany, NY on Feb. 23, 2019..
Dan Mauriello, Hauppauge defeats Warren McDougald, Niagara Wheatfield in overtime in the 152LB Div 1 final of the 2019 NYSPHSAA State Championships at the Times-Union Arena in Albany, NY on Feb. 23, 2019..
Angelo Petrakis, Massapequa is defeated 19-3 by Jake Logan, New Rochelle in the 182LB Div 1 final of the 2019 NYSPHSAA State Championships at the Times-Union Arena in Albany, NY on Feb. 23, 2019..
Kyle Mosher, South Side/East Rockaway defeats Cooper Kropman Penfield in the 160LB Div 1 final and celebrates at the 2019 NYSPHSAA State Championships at the Times-Union Arena in Albany, NY on Feb. 23, 2019..
State wrestling tournament photos and videosSee all the photos and videos from the New York State high school wrestling championships weekend in Albany on Feb. 22-23, 2019.